Elizabeth Robbins with her mother Linda Robbins at the Midcoast Academy of Music. ROCKLAND, Maine — Elizabeth Robbins was born with two things that were out of her control. The first was a bilateral cleft lip and palate that made it nearly impossible for her to speak. The second was a compulsion to always sing. Linda Robbins of Waldoboro adopted Elizabeth, now 8, when she was 2 years old. In the past six years, Elizabeth has had nine surgeries to finish closing her cleft lip and palate, and she will have to go through two more. Instead, the surgeries have helped Elizabeth in her pursuit of singing. Last summer, she was awarded a scholarship to the Rockland-based Midcoast Music Academy through the nonprofit organization Raising the Blues, which works to connect children with physical, medical or educational challenges to music. Elizabeth sings with a children’s group at her church, but aside from that, the voice lessons she’s been taking once a week at the music academy for the past four months have been her only structured musical training. While Elizabeth might be shy to open up about some things, when it comes to singing, there’s no stopping her. “[Singing] makes me happy,” Elizabeth said. The first time Linda Robbins heard her daughter sing, they had been home in Maine for a couple of weeks after Elizabeth’s adoption in China. At that time, Elizabeth had not gone through any surgeries for her cleft palate. With a bilateral cleft lip and virtually no palate, Elizabeth couldn’t produce audible speech, her mother said. But one day, she was playing by herself and she started making a melody with different notes. “I was just blown away,” Linda Robbins said. From then, Elizabeth has not stopped singing. After her surgeries, she would sing in the hospital, her mother said. Linda Robbins is a teacher at Oceanside Middle School in Thomaston and during one instance last year that she had Elizabeth with her, the school’s music teacher heard Elizabeth singing. She was stunned at Elizabeth’s perfect pitch and recommended that she start voice lessons. The teacher knew about the mission of Raising the Blues and got the process rolling. This summer on stage at the North Atlantic Blues Festival in Rockland, Elizabeth accepted her scholarship to the Midcoast Music Academy. The Midcoast Music Academy opened in 2012 and now provides music education to about 180 students. The academy provides instrumental instruction as well as vocal instruction. Tom Ulichny, the academy’s founder and director, said he has seen music act as a healing tool for a number of students at the academy. 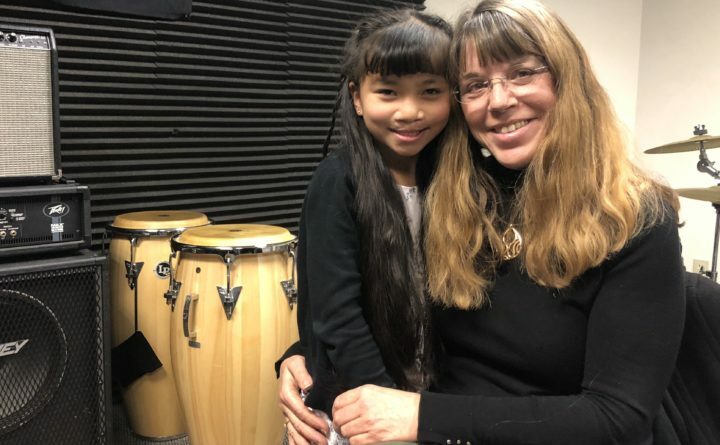 At her weekly lessons with vocal instructor Abigail Nash, Elizabeth is learning how to read music, do breathing exercises and ear training, as well as practice pronunciation and enunciation. Because of her cleft palate and surgeries, Elizabeth works with a speech therapist. A lot of what she learns in her therapy can be practiced through singing, a bonus that Elizabeth said makes practicing her speech therapy fun. “The singing helps the speech and the speech helps the singing,” Linda Robbins said. Elizabeth hopes to take her singing across the country, but in the meantime she hopes the voice lessons help her sing in church. She’s started to make up her own songs that her mother says she will randomly sing. In the province in China where Elizabeth was born and lived for the first two years of her life, the people sang songs while planting and harvesting rice. Some of the lyrics Elizabeth comes up with, Linda Robbins believes, can be traced to her early years in China.